Tim Stein answers your piano playing questions My left hand always seems to be weaker than my right. How can I develop it? 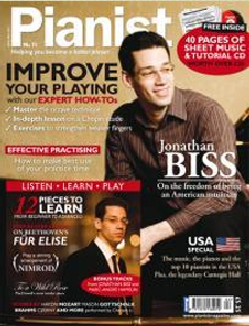 Aside from the usual run of arpeggios and scales, there are a number of exercises and pieces written specifically for the left hand at varying levels.This includes Berens’ Training for the Left Hand op 89, Carl Czerny’s 24 Studies for the Left Hand op 718 and the virtuosic Godowsky/Chopin studies. Margaret Fingerhut’s illuminating article (‘Putting your left to rights’, Pianist No 26) highlights other material you can use. You can also use the passagework in your existing repertoire. If you are looking for good musical examples other than studies, the easier Beethoven sonatas (lots of octaves and tremolos) and Mozart (lots of Alberti bass) will provide plenty of scope. A useful general technique for overcoming left-hand (and, incidentally,right-hand) problems is ‘mirroring’,where you switch the difficult part from one hand to the other. Much of the left-hand material we come across in the music we play, especially from the Classical or Romantic periods, contains broken chords, octaves, arpeggios and so on. Isolating and working on any of these slowly can help. Try varying the tempos, the touches (legato, staccato),the rhythms (long-short,short-long) and the dynamics, to increase your overall endurance and control. You can make short exercises out of the music you are learning by transposing it to a different key or even a different octave range. Alternatively, work on a Hanon exercise or an easy Czerny study. Because they are easily learned and memorised, you will have time to focus on the hand and finger action.As with all repeated exercises, make sure you take plenty of breaks.